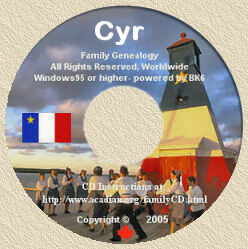 Acadian Genealogy Homepage; 1671 Census and the Hebert Families! Click here to view great HEBERT gift ideas! The following is a reprint (with thanks) of article which appeared in the Baton Rouge newspaper The Morning Advocate dated May 7, 1998 in Damon Veach 's Column, and entitled "Louisiana Ancestors". The original author of the article was Brian Comeaux. The first Acadian census in 1671 mentions two Hebert families. The first was that of Anthoine Hebert and his wife, Genevieve Lefranc, and the second was that of the widow of Estienne Hebert, Marie Gaudet. Due to the number of certificates of marriage dispensation that still exist, it has been possible to determine that Anthoine and Estienne Hebert were brothers. They were the sons of Jacques Hebert and Marie Juneau of Balesmes, in the present day French department of Indre-et-Loire, located near the city of Tours. They came to Port Royal around 1648 during the governorship of Charles de Menou d'Aulnay, whose French seigneurie was not far from Balesmes. D'Aulnay's business agent, Emmanel LeBorgne, sieur du Coudray, recruited colonists from d'Aulnay's seigneurie and the surrounding towns as colonists for Acadie. Anthoine was apparently married before his departure and came to Port Royal with his wife. Estienne married within a year of his arrival to Marie Gaudet, the daughter of Jehan Gaudet and Francoise Marie Daussy. They were two of the earliest Acadian settlers. Estienne and Marie Gaudet had 10 children, five boys and five girls. Some of the descendants of Emmanuel Hebert, one of the twin sons of Estienne Hebert and Marie Gaudet, were among the many Hebert families who eventually made their way to Louisiana following the deportation. Emmanuel and his wife, Andree Brun, settled near Port Royal. Emmanuel likely inherited the farm of his father. This was Andree Bruns second marriage. Brun was widowed from Germain Therriot and had 3 children, two boys and a girl, from her first marriage. By the census of 1693, Emmanuel had become one of the most prosperous inhabitants of the Port Royal region. He had 30 arpents in cultivation and owned 20 head of cattle and 15 swine. Emmanuel Hebert and Andree Brun had 6 children, five boys and one girl. The girl was named Marguerite. She was born in 1681 and married Jean Pierre Thibodeaux, the son of Pierre Thibodeau and jeanne Therriot (Theriot). Jean dit Emmanuel, his wife, Magdeleine Dugas, and their family helped to found the Memrancook-Chipoudy region in present day New Brunswick, Canada. One of their sons, Jean Baptiste, married Claire Robidhaud, the daughter of Charles Robichaud. Eventually a feud erupted between the Heberts and their allies, the Cyrs (Suire) agains the Blanchard family. 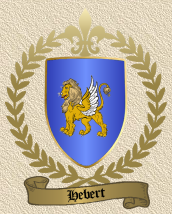 One of the Cyr boys, Jean Jacques, married the second daughter of Jean dit Emmanuel named Marie Josephe. Jean Jacques Cyr and his wife and two of her younger brothers, michel (who married Elizabeth Benoit) and Belony (who married jeanne Savoie, daughter of Francois Savoie), encroached on land along the Memramcook River claimed by the Blanchard family. It was no doubt therefore a Blanchard who gave the Hebert settlement the rather unflattering name of Butte a Retard. Finally, one of the sons of Jean dit Emmanuel, Armand, married Madeleine Richard, the daughter of michel Richard dit Beaupre. Madeleine's brother, Jean Baptiste, was an ally of the Blanchard family, and this marriage began a process of reconciliation between the Blanchards and the Heberts in the Memramcook Valley just a few years before the British invasion of 1755. Five Hebert families and two single Hebert men were among the earliest Acadian arrivals in Louisiana. The five families were all settled along the first Louisiana Acadian Coast in St. James Parish, while the two single men settled in the Attakapas country by 1766. One of the five St. James Parish families was headed by Claire Robichaud, the widow of Jean Baptiste Hebert of Memramcook. In 1767, nine more Hebert families arrived in Louisiana from exile in Maryland and settled near present day St. Gabriel in Iberville Parish. One of the Hebert families that arrived from Maryland provided Louisiana with its 15th governor. Paul Octave Hebert, the great-great-great-great grandson of the original Estienne Hebert was Louisiana's governor from 1853-1856. He was born and raised on a sugar plantation a few miles down river from Plaquemine in Iberville Parish. His father was named Paul Hebert, who married Eugenie Hamilton in 1817. A number of Heberts eventually settled along the Bayous Teche and Vermillion. At least one of the sons of Jean dit Emmanuel Hebert (who married Magdelaine Dugas) of Memramcook, Belony, was one of these settlers. He and his wife, Jeanne Savoie, and at least two of his sons, Joseph Pepin (who married Madeleine Trahan in 1771) and Jean Charles (who married Madeleine Robichaud in 1773) settled along the Bayou Vermilion. Many of their descendants still live along the bayou in Lafayette and Vermilion parishes. Mathurin, who married Catherine Dore in 1787 lived near Fausse Pointe. Jean Baptiste II later moved nearer to his brothers. Some of their grandsons eventually moved west into Calcasieu Parish, thus establishing the Hebert name there. Eighteen Hebert families arrived with the Acadians from France in 1785. Most of these families settled in the Lafourche and Terrebonne regions. One of the largest of these families was headed by Jean Pierre, who married Suzanne Pitre. Jean Pierre was the son of Rene dit Gros Hebert. Rene was the son of Jehan le cadet and the grandson of Anthoine and Genevieve Lefranc. His sons settled along Bayou Lafourche near Thibodeaux. Bobby Hebert, ex-NFL quarterback, is a descendant of Jean Pierre Hebert and Suzanne Pitre. Another family that arrived in 1785 was headed by Joseph Hebert, who married Marie Jeanne Durembourg and settled in present day Terrebonne Parish along Bayous Terrebonne and Petit Cailou. Today the Hebert family is one of the largest in Louisiana. There are concentrations of the families throughout Acadiana, but especially in Lafayette, Vermilion, Lafourche and Terrebonne parishes. "While interesting and informational, there are unsubstantiated facts in this article. Most of the literature I have read and other data suggest the parents of both Etienne and Antoine are unknown. Antoine's surviving son Jean, had several children that were not mentioned and I am a direct descendent of one of them Augustin."